With the final flicker of summer sun upon us, and our youngest little chick flying the coup back to school, we find ourselves on our last "summer dinner extravaganza." We do a lot of special requests throughout the summer, trying to get all of "the favorites" covered before the bags are packed and the wings of flight are unfurled...not too unlike the hundreds of families with kids that come home for summers or drop in for long weekends. It's not that we deprive ourselves of tasty meals during the rest of the year mind you, it's just that these dining moments are strongly determined by our offspring. And we love it! This little south-of-the-border number was the requested finale. I've made a few chili rellenos over the years (many the traditional, battered and fried versions) until I tasted one that was simply roasted, stuffed with amazing queso oaxaca, and plated in a sumptuous salsa...and realized that I probably wouldn't make another battered relleno again. 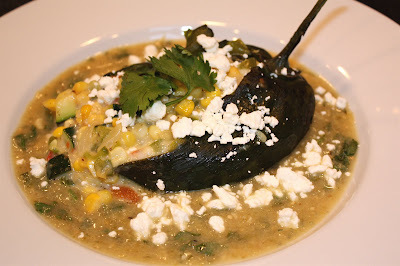 After traveling to Sedona, Arizona recently, I then tasted a relleno that was stuffed with an amazing variety of vegetables and creamy cheese, surrounded by a smooth and spicy tomatillo salsa, and realized that we'd found our relleno! 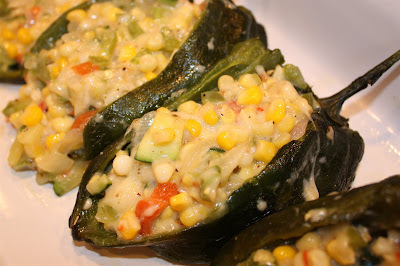 It has all the flavor that a roasted poblano offers plus a wonderful medley of in-season veggies (like corn and zucchini) and a fresh, bubbly tomatillo salsa that provides a bite that wonderfully contrasts with the subtle flavor of the stuffed chili. While I couldn't get the exact recipe for the relleno I had in Sedona, I made note of the various elements of the dish and pulled together this recipe which I feel closely resembles that delicious veggie variety. You can, of course, find canned tomatillos in most any market and whip up the salsa using those. However, if you have a bit more time, the fresh tomatillos offer a wonderful succinct flavor that is well worth the extra effort. I found a great green tomatillo salsa in Rick Bayless's Mexican Kitchen, a cookbook filled with incredible mexican recipes, tips and general cooking information. I also found the recipe on-line so I think it's safe to offer here, with the proper credit. Before getting to the details, remember that this is a simple endeavor. There is a bit of slicing and dicing, and roasting and simmering. However, if time is a factor, you can break the process down quite easily by prepping your salsa a day before and simply handling the last "on-stove" step on the "day of." Or, prep the whole thing and just warm it before plating. I don't think it would really matter. You can also prep the veggie mix and just keep it in the fridge until you are ready to make your rellenos and just simply warm it up before stuffing your chiles. 1. 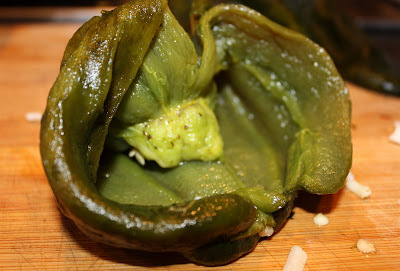 Place poblano chiles on a baking sheet and place in oven under a very hot broiler (approximately 4" from heat) until chiles begin to blister and blacken on one side, about 3-5 minutes. Turn chiles over and roast other side. When well blistered and blackened, remove from oven and place in a plastic or paper bag to sweat skins loose (10 to 15 minutes). 1. Fill a medium (2- to 3-quart) saucepan with water, salt generously and bring to a boil. Add tomatillos and chile(s) and simmer vigorously over medium heat until the tomatillos soften and pale in color everywhere except on the indented stem end, 2 to 4 minutes. Drain and cool in a dish. 2. Transfer tomatillos and chile(s), and any any accumulated juices, to a blender. 3. Heat 1-1/2 tablespoons vegetable oil in a heavy skillet. Add onion and cook, stirring often, until onions are golden brown, about 8 minutes. Stir in the garlic and cook another minute. 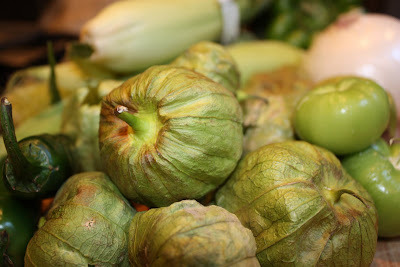 Add onion and garlic mixture to tomatillos in blender and cover loosely. Ventilate blender and pulse mixture to rough-looking puree. 4. Once your veggie mixture is ready (below), add 1/2 tablespoon vegetable oil to a large skillet over medium heat to finalize your salsa. When skillet is hot, add salsa from blender and cook over medium heat for about 4 to 5 minutes, as it sizzles to a darker and thicker sauce. Simmer on lower heat for another 10 minutes as it thickens enough to coat the back of a spoon. If desired, add some heavy cream, yogurt or sour cream to silken the texture and enhance the flavor (I added sour cream...about 1/2 cup). Set aside until plating. 1. Add 2 tablespoons olive oil to large skillet over medium heat. Once heated, add onion and cook until slightly translucent. Add corn and continue to cook through for about 1-2 minutes. Add green peppers, cook another minute. 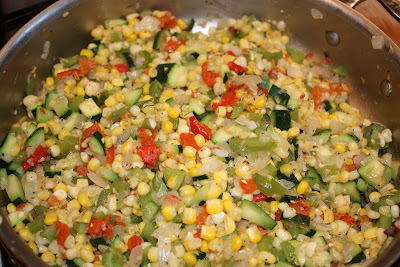 Then add zucchini, roasted peppers, cumin, and coriander and cook entire mixture until all veggies are well-melded. Add cheeses to incorporate with mixture and melt. Season with salt and pepper, to taste. 2. 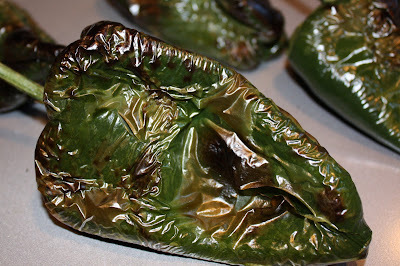 Place skinned and cleaned poblanos on a slightly oiled, glass baking dish. Fill each chili with veggie mixture and place in oven for approximately 15 minutes. 3. Remove chiles from oven. Ladle a few spoonfuls of salsa into shallow bowls and top each with a chili. Garnish with cilantro and crumbled goat cheese and serve. Yum...ole!! !